Excellent condition pair of Monitor Audio 703 PMC speakers previously enjoyed as fronts in a high-end surround set-up. From a smoke-free, pet-free home. Upgraded with Chord Odyssey internal cable, 20SE crossovers and 20SE tweeters under the guidance of Montior Audio. Immaculate besides the unfortunate ripple on one of the tweeters. This hasn’t affected the sound from them and you won’t see this unless you peer at them, keep the grilles on, and sit on the sofa, and enjoy listening to them. The veneer on the front of one the speakers, behind the grille, appears to be a bit lighter at the bottom left of the bass cone as you look at it… I have no idea how or why. This is not an artefact of the photo. It actually does look like that. Come with original boxes, instructions and floor spikes. Very good condition pair of Monitor Audio 700 PMC speakers previously enjoyed as rears in a high-end set-up but extremely capable pair of stereo speakers in their own right. From a smoke-free, pet-free home. They sound gorgeous, conveying emotion well, with a surprising amount of bass for the enclosure size without sounding boomy. Sold on ebay for £295. 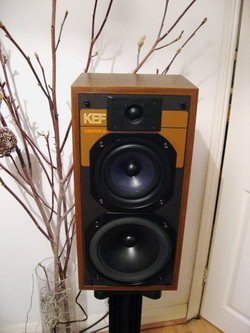 These KEF Cantor III are finished in simulated walnut veneer… Vinyl wrap really, but the best example I’ve seen of ‘fake’ wood. They are in excellent condition with original drivers, binding posts, stickers on the back and grilles. There are some minor imperfections to the edges of the veneers, shown in the photos but I would still consider the speakers to be in excellent condition. Mains lead, original box and packaging, instructions, remote including an extra system remote purchased later and free mainland UK postage. Owned from new by me from June 2011 and bought directly from Peter Qvortrup of Audio Note UK LTD as NOS (New Old Stock). Although pre-owned the amplifier is ‘as new’ but sold as ‘used’. I’ve used this amp with all sorts of power-amps from valve, to solid-state, to T-amp and it’s very good with all of them. It also has two pre outs (as well as a tape out) for easy monoblock power amp hook up, and the addition of a headphone amp should you wish to. The included remote(s) operate volume and input selection. I couldn’t go back to a non-remote amp! The M-Zero produces a very natural, unfatiguing sound using simple amplifier circuitry so as to not deter from the sound of the source although it still has that natural ‘valve feel. Some of the reviews are for the non-remote version but the sound is the same… the R version is more convenient! The amp will be double boxed, ie boxed in its original box and then boxed again to protect both the amp and the original box in transit. Mainland UK insured postage is included in sale. Collection from Wallington, SM6, is also available where you may choose to pay 'cash on collection'. 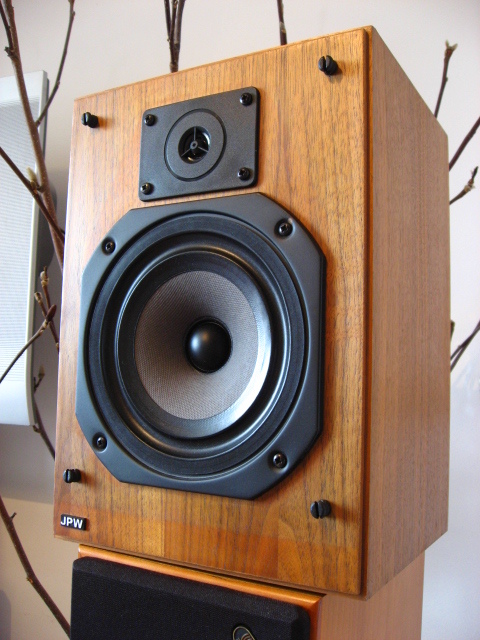 Excellent pair of JPW Sonata speakers finished in a rare, handmade real walnut veneer cabinet. Every pair has a slightly different finish being handmade with natural wood. This pair has a fairly dark walnut finish with contrasting graining. Getting difficult to find in this condition, in this finish, for sale, anywhere. Towards the end of the production of the JPW Sonata, Richer Sounds acquired JPW and later editions are finished in vinyl-wrap veneer to significantly reduce production costs. The sound, finish, and ultimate value of the later editions are much less than the real wood veneer versions, and especially, the natural walnut (and also the ash) finish editions. Stunning pair of fantastic condition AVI Neutron III (3) speakers in cherry finish. Five litre, 12mm MDF enclosure, rear ported finished in cherry, real wood veneer (veneered both internally and externally for rigidity). 127mm (5”) Vifa doped curvilinear paper bass cone 25mm voice coil, rubber surround. 28mm Scanspeak handmade doped fabric tweeter. Vifa 8" Bass cones - M21 WG-09-08 Bass Drive units (pair) refurbished. Picture of the pair for sale will be posted as soon as available. 'Time warp' pair of JPW Sonata speakers finished in a very rare, hand made real ash veneer cabinet. Features an Audax tweeter and Elac bass driver in a sealed / infinite baffle cabinet. They are pretty much as new. They have minor scratches on the base of each of them where they have been demoed on spiked stands. These will not be seen in situ. They come in their original box, instructions and dedicated cloth speaker grilles. Wonderful, award winning, neutral sounding speakers.